◎ The PAP reforms are helpful to Xi in two ways. On Oct. 31, the National People’s Congress deliberated a draft legislation on temporarily suspending the Law on the People’s Armed Police Force (PAP) while the paramilitary was undergoing reform. The draft legislation indicates that the PAP will be subjected to significant reforms. The PAP covers security for all important officials and work units. 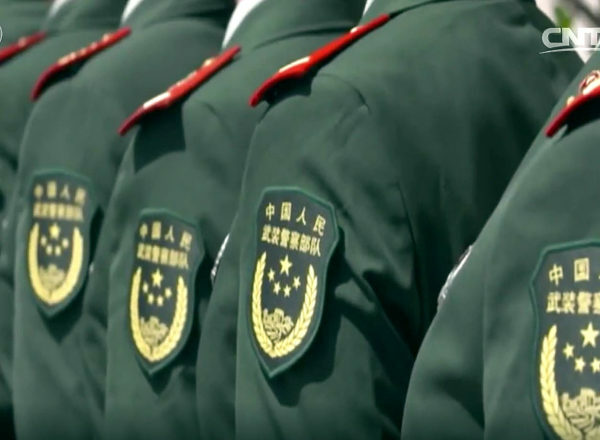 China’s top leadership, however, is protected by a separate security force. In other words, whoever controls the PAP has control over the life and safety of nearly all senior Chinese officials. The PAP’s 14 mechanized divisions were repurposed from People’s Liberation Army (PLA) Class B infantry divisions. However, the PAP divisions lack the heavy weaponry used by PLA army groups. In times of war, the PAP mechanized divisions can function as light infantry. In 2012, outgoing security czar Zhou Yongkang mobilized PAP troops in Beijing to aid Politburo member Bo Xilai’s attempted coup against Hu Jintao. Zhou and Bo are key Jiang faction members. The PAP now comes under the sole command of the Central Military Commission (CMC). Before the restructuring, the CMC and the State Council controlled the CMC. In June 2016, the PAP’s three top-level departments (command headquarters, political department, logistics department) were reorganized into four departments (staff department, political work department, logistics department, discipline inspection commission). The PAP added an equipment department in 2017. The PAP officer ranks were reduced by 36,000 personnel. PAP corps were downgraded from army level to division level, while detachments were reclassified as regiments. The PAP’s 14 mechanized divisions were cut to four, and the troops from the disbanded divisions were reintegrated into the various regiments and squadrons. The PAP closed all but four of its academies, disbanded its marching bands, and transferred control of its hospitals to local governments. Several senior PAP officials have been probed and charged with corruption after Xi Jinping took office in 2012. Prominent names include former PAP commander Wang Jianping, former deputy commanders Dai Sujun and Niu Zhizhong, former political commissar Xu Yaoyuan, and deputy political commissar Yu Jianwei. In April 2016, the CMC announced that the PAP would be winding up its “paid services,” which include business ventures like real estate, hospitals, and entertainment projects. The PAP is slated to full exit its various businesses by March 2018. Our take: The PAP reforms are helpful to Xi in two ways. Simplifying the PAP’s command structure and weakening its military strength guards against Xi’s factional opponents abusing the paramilitary in another coup attempt. Xi’s rivals in various local governments will also not be able to easily abuse the PAP to suppress civilians and stir up social problems. PAP-run hospitals are hotbeds of state organ harvesting activity, according to independent researchers and media associated with the Falun Gong spiritual community. The harvesting of organs from Uyghurs, Tibetans, house Christians, and Falun Gong prisoners of conscience started during Jiang Zemin’s tenure, according to researchers. In recent years, the United States House of Representatives and the European Parliament issued legislation condemning China’s organ harvesting practice. Xi might be separating the PAP from its hospitals to facilitate investigations in the future.